Entry by overdoor on Fri May 4 19:26:22 2012. And Rin and Yukio to the side! 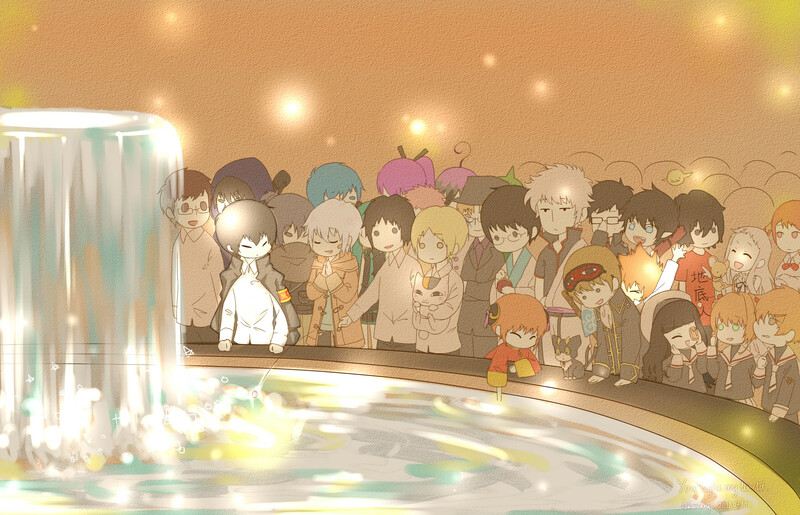 omg I see Natsume, Nyanko-sensei, Tanuma and Natori jshakhja. OMG there are 2 okumora twins (1-on the side next to hibari)(2-behinde tsuna)sweet! Tsuna is getting pushed around by the crowd..
Ooh I see Hibari, Tsuna, the Okumura twins, Amaimon and Mephisto, Natsume! and Natori and tanuma, Nezumi and Shion, Sakura, Syaoran and Tomoyo too. Hatsune Miku and perhaps... is that Ano hana? Y does Hibari look like chinese!?? ?